The National Thoroughbred Racing Association, Daily Racing Form and the National Turf Writers and Broadcasters announced this evening that Zayat Stables’ American Pharoah, the Triple Crown and Breeders’ Cup Classic winner, was unanimously voted as Horse of the Year at the 45th Annual Eclipse Awards Ceremony at Gulfstream Park Racing & Casino in Hallandale Beach, Fla.
American Pharoah becomes the second unanimous Horse of the Year, joining John Henry in 1981, to sweep all votes in the Horse of the Year category. American Pharoah received all 261 votes from the National Turf Writers and Broadcasters, Daily Racing Form and the National Thoroughbred Racing Association block of Equibase field personnel and North American racing officials. American Pharoah also was a unanimous choice for Champion 3-year-old by the Eclipse Award voters. In 2015, American Pharoah won seven of eight races, six of those grade one events, including the Arkansas Derby, Kentucky Derby, Preakness Stakes, Belmont Stakes, Haskell Invitational and the Breeders’ Cup Classic. 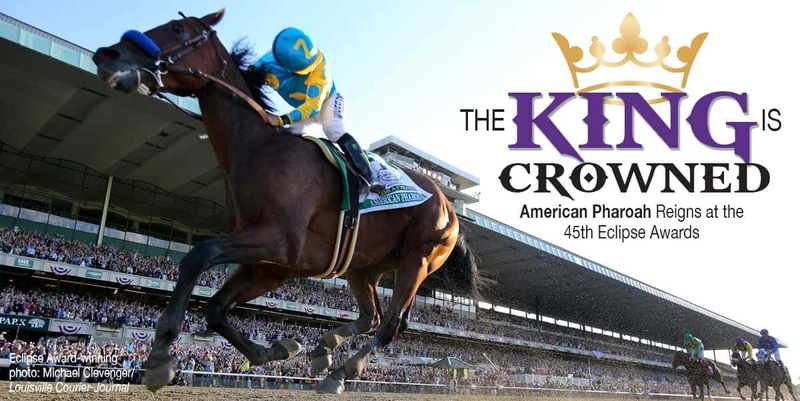 He was the first horse in 37 years to sweep the Triple Crown and the first to sweep what has been referred to as Thoroughbred racing’s “Grand Slam” of the Triple Crown races and the Breeders’ Cup Classic. He also set a single season earnings record of $8,288,800. It was also a big night for the American Pharoah team as Zayat Stables won both the Outstanding Owner and Outstanding Breeder awards and American Pharoah’s trainer, Bob Baffert, won his fourth Outstanding Trainer Award. American Pharoah’s jockey, Victor Espinoza, finished second in the Outstanding Jockey category to Javier Castellano, who captured the honor for the third consecutive year. Spendthrift Farm’s Beholder, undefeated in five starts in 2015, won her third Eclipse Award this evening, taking the Older Dirt Female trophy. Beholder won the 2-year-old Filly Championship in 2012 and was the Champion 3-year-old Filly of 2013. In voting that concluded January 2, 2016, Eclipse Awards voters cast their ballots to rank the top three horses and individuals in each Championship division on a 10-5-1 point system basis. This voting established the top three finalists in each division, whose names were released Jan. 6, 2016. The votes are tabulated and certified by Strothman and Company. The tallies below represent only first-place votes from members of the consolidated voting entities, NTRA, Daily Racing Form and National Turf Writers And Broadcasters. Nyquist, 255; Mohaymen, 3; Voter Abstentions, 3. Songbird, 260, Catch a Glimpse, 1. Stellar Wind, 108; I’m a Chatterbox, 47; Found (IRE), 46; Lady Eli, 34; Lovely Maria, 12; Curalina, 11; Include Betty, 2; Voter Abstentions, 1. Honor Code, 126; Liam’s Map, 95; Tonalist, 14; Effinex, 12; Shared Belief, 9; California Chrome, 3. Voter Abstentions, 2. Beholder, 256; Stopchargingmaria, 4; Sheer Drama, 1. Runhappy, 255; Private Zone, 2; Rock Fall, 2; Mongolian Saturday, 1; Secret Circle, 1. La Verdad, 98; Wavell Avenue, 90; Lady Shipman, 41; Cavorting, 19; Unbridled Forever, 5; Ageless, 1; Birdonthewire, 1; Fantastic Style, 1; Voter Abstentions, 5. Big Blue Kitten, 134; Golden Horn (GB), 63; The Pizza Man, 41; Flintshire, 18; Chiropractor, 1; Grand Arch, 1; Voter Abstentions, 3. Tepin, 211; Found (IRE), 38; Stephanie’s Kitten, 8; Lady Eli, 2; Curvy (GB), 1; Voter Abstentions, 1. Dawalan (FR), 165; Bob Le Beau (IRE), 47; African Oil (FR), 2; Demonstrative, 2; Grinding Speed, 1; Voter Abstentions, 44. Zayat Stables, 220; Kenneth and Sarah Ramsey, 26; Midwest Thoroughbreds, Inc., 6; Reddam Racing, 2; Godolphin Racing, 1; Voter Abstentions, 6. Zayat Stables, 190; Kenneth and Sarah Ramsey, 39; Darley, 13; WinStar Farm, 5; Adena Springs, 4; Spendthrift Farm, 1; Stonestreet Thoroughbred Holdings, 1; Voter Abstentions, 8. Bob Baffert, 200; Todd Pletcher, 44; Chad Brown, 12; Karl Broberg, 1; Jerry Hollendorfer, 1; Voter Abstentions, 3. Javier Castellano, 184; Victor Espinoza, 70; Joe Bravo, 1; Pedro Monterrey, Jr., 1; Irad Ortiz, Jr., 1; Joel Rosario, 1; John Velazquez, 1; Voter Abstentions, 2. Tyler Gaffalione, 149; Eric Cancel, 63; Angel Cruz, 9; Ashley Broussard, 6; David Lopez, 3; Jorge Robles, 1; Voter Abstentions, 30. The winner of the Award of Merit, voted on by a panel of representatives from the three presenting organizations and previously announced, is Leonard Lavin. The Award of Merit is presented to honor outstanding lifetime achievement in the Thoroughbred industry. John O’Neil was honored as the 2015 Horseplayer of the Year as the winner of the Daily Racing Form /NTRA National Handicapping Championship. Audio and Multi-Media Internet – Mary Simon, Daily Racing Form, “Regret at 100”; April 20, 2015.